Wreaths Across America is a program we have been involved with at Lancaster Cemetery for the last seven years and it seems that each year something magical and inspiring finds its way around the hundreds of wreaths and veterans that are at rest there. Sometimes the chance meetings of individuals and the spirits of those long-since-passed veterans among those wreaths pulls at the heartstrings and soon stories and questions start being told and asked. 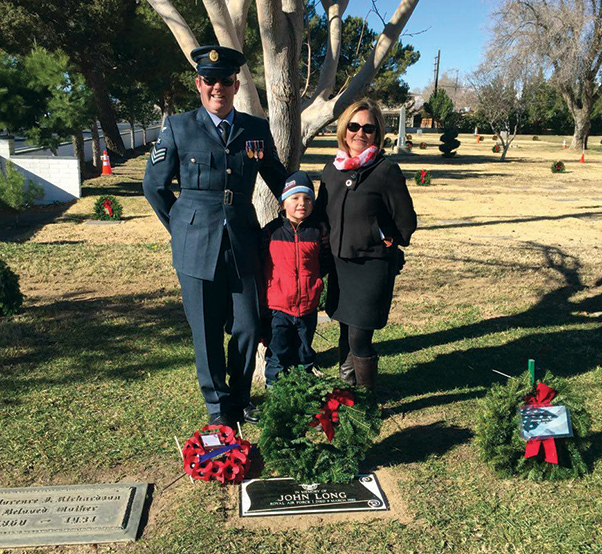 That’s just what happened at last year’s wreaths program when a visiting family from England asked questions about a certain airmen that was lost here in Lancaster during World War II. Dayle Debry struck up a conversation with RAF Chief Technician Daniel Foulkes and his wife Suzanne about the resting spot of RAF Cadet Meyer Bernard Himelstaub who was killed in an accident at Lancaster’s War Eagle Field in 1942. What came from that conversation turned into a year-long project when Dayle and Daniel started to research the possibility of another possible British veteran at rest in an unmarked grave at Lancaster Cemetery. Dayle shared her research with Daniel who, in turn, started the quest back in England as to the history of one John Long. 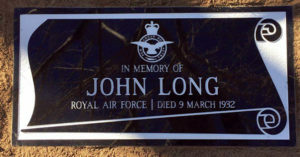 Well the news came that not only was he a veteran but he was a member of the RAF and served as an airmen in World War I! 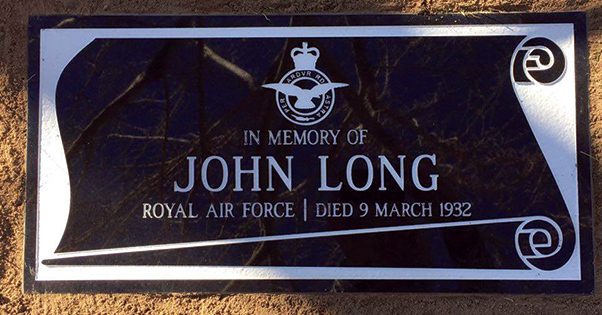 At that point the unmarked grave of John Long — who had died in 1932 and rested for close to 85 years virtually unknown — became a project for the Foulkes family, along with Dayle and Friends of the Lancaster Cemetery, to have this World War I veteran brought back from the missing and his final resting spot remembered and honored. Because he was not killed during a time of war the Commonwealth War Graves of England could not provide John with a headstone so the Foulkes family, with the help of their friends and the Friends of the Lancaster Cemetery, purchased an English style veterans headstone for his final resting place. 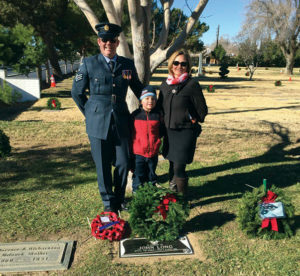 On the 12th of this month at the Wreaths Across America program Daniel, Suzanne and their son Harry, along with friends, stood proud as they gazed upon the new headstone with a fresh wreath and the proper British remembrance bouquet of poppies for John Long, the lost RAF airmen from World War I. As luck would have it RAF Cadet Himelstaub’s and Airmen Long’s graves are just a few feet away from each other and if you ever visit Lancaster Cemetery during Veterans Day or Memorial Day just look for the two Union flags and you will see two of our brothers from across the sea that now are our responsibility to care for. Merry Christmas everybody and until next time, Bob Out!